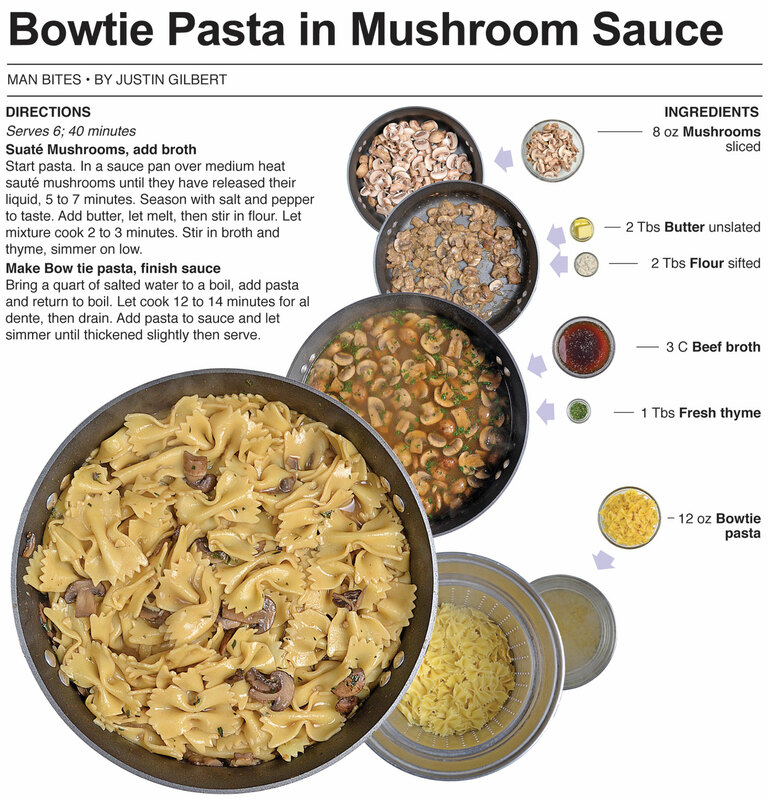 I would rate this mushroom and bowtie pasta dish as a 7 on a scale of 10. 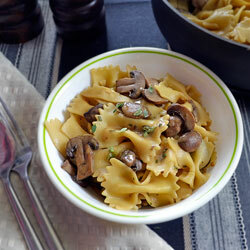 It had good flavor, the noodles and mushroom were cooked spot on, and it worked as a side dish really well. I would be happy to put this out at any family get-together or eat with dinner anytime, which is why I thought I should publish it. That said, it lacked the punch that I like to get with most of my dishes here at Behind the Bites. I think I needed a cream element to help make it more rich or some shredded beef for more hardiness in the overall recipe. Any suggestions are welcomed here, please message me or make a comment if you see an easy way to put this dish over the top. It’s obvious that it could be beef and noodles. I think this dish could stand out in a different way though. I’m going to revisit this in the near future - in the meantime I’d like to here what readers think. Any creative solutions for knocking this dish out of the park? I have a weird custom when I purchase mushrooms at the store. I can’t bring myself to buying them already sliced. That would take all the fun out of the process for me. There is something about washing and slicing them up. That goes for anything I make though, I would much rather do the slicing and dicing myself - it’s part of why I love cooking. Now, that goes for small amounts. If I need 20 pounds of mushrooms and can get them pre-sliced, I think I’d pay a little extra to avoid 2-hours of work. 10 minutes of work is cool, 2 hours – not so much. Start pasta. 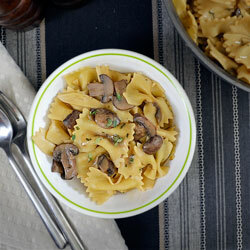 In a sauce pan over medium heat sauté mushrooms until they have released their liquid, 5 to 7 minutes. Season with salt and pepper to taste. Add butter, let melt, then stir in flour. Let mixture cook 2 to 3 minutes. Stir in broth and thyme, simmer on low. 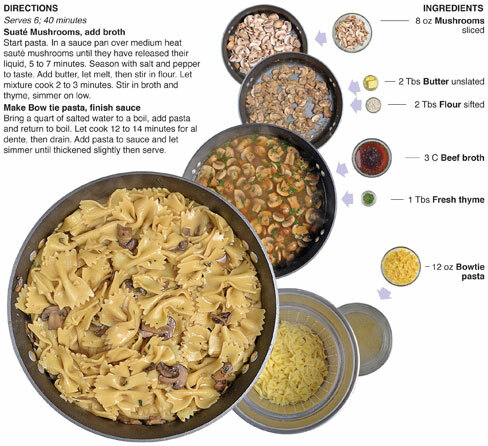 Bring a quart of salted water to a boil, add pasta and return to boil. Let cook 12 to 14 minutes for al dente, then drain. Add pasta to sauce and let simmer until thickened slightly then serve. This looks simple and delicious. Plus my thyme plant has just took off so I need to use it! Your lucky why_in_the_heck my thyme plant is buried under 10 inches of snow right now! Yum, your pasta looks delicious, I love bow pasta! The directions say to "stir in milk, broth and thyme"
Milk is not listed in the ingredients however. Anonymous - You are absolutely right! That is an error I did not catch before I published the recipe. Thanks for the catch ... Will fix right away.